“It’s Saturday Night in Death Valley and here come your Fighting Tigers of LSU.” This is how every home game begins for the Louisiana State Tigers. The Bayou Bengals play ball in front of some of the most passionate and raucous fans in college football, over 102,000 each time they are at home.<align=”left”> What’s even more impressive is that on game day, Tiger Stadium transforms into one of the largest cities in Louisiana. Like many other places in the country, LSU football is more than sports; it’s a way of life. People in this part of the country are as passionate about their Tigers as any other fans in college football. It’s been called “the most feared road game in the country” and “Death Valley” for a reason. Tiger Stadium was constructed in the early 1920s and opened on November 25, 1924 when LSU battled Tulane. The original stadium seated 24,000 fans, with grandstands on both sides of the gridiron. Six major expansions have been completed at the stadium over its nearly nine decades of existence. Two additions were completed in the 1930s, the first in 1931, when the capacity increased by 10,000. The second was completed in 1936, when the north endzone was enclosed increasing the seating capacity to 46,000. The south endzone was enclosed in 1953 and the first of two upper decks was added in 1978 pushing the capacity to over 78,000. The 11,600 seat addition in 2000 allowed the Tigers to pack even more screaming fans into Tiger Stadium. Throughout the 2005 season, the Tigers continued to expand Tiger Stadium with the west side expansion. This $60 million expansion added 3,255 club seats, a new press box and upper deck on the west side of the stadium. Completed by the 2006 season, this expansion increased the seating capacity of Tiger Stadium to 92,400. This addition allowed LSU to continue to average over 90,000 fans per game. 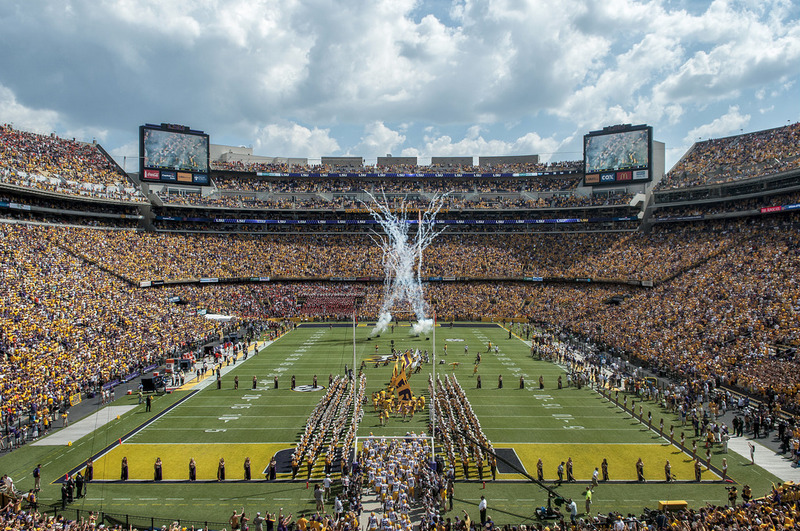 In February 2012, LSU announced plans to further expand Tiger Stadium by the 2014 season. This expansion project connects the existing upper decks on the south side of the stadium, adding a lower level containing 4,000 club seats, two levels of luxury suites and a 1,500 seat upper deck increasing the seating capacity to over 102,000.<align=”left”> It is now the 6th largest stadium in the country and Tiger Stadium remains one of the most exciting places to watch a football game in the country.